Despite all of the social media platforms out there, it seems like I never hear school librarians talking about Reddit. This site, which bills itself as “the front page of the internet,” has tons of information, features an easy-to-use interface, and harnesses the power of crowd-sourcing. It’s a piece of free technology with lots of potential for educators, particularly school librarians. One of the main reasons I wanted to write about Reddit in this blog post is because I am currently working on my masters degree so I can move from the classroom to the library. As I’ve been working my way through classes, I have seen the incredible benefit of having an online community of professionals who are willing to engage in discussions and debates. It has been wonderful to be part of a group willing to help each other problem-solve as new experiences come up and new issues arise. In short, I’m hoping to recreate the amazing online discussion groups I’ve been fortunate enough to be part of in grad school. Reddit is a great platform for this. In addition to being a wonderful platform for online discussions, Reddit has so much more to offer! 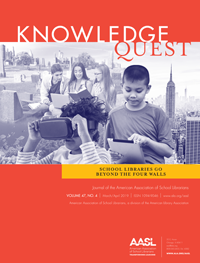 It’s a great source of information, and can be a powerful tool for librarians and educators of all stripes! At thirteen years old, Reddit is like the middle child of the two major social media outlets. It’s a smidge younger than Facebook (which opened its doors 14 years ago), a bit older than Twitter (which went live in 2006). That Reddit is not only still around, but quietly thriving, shows that this is a robust platform. And it offers some advantages not seen in other social media technologies. Unlike Facebook, Reddit has not (yet) been embroiled in multiple scandals about data mining and privacy issues. This may be due in part to the fact that Reddit lets users create their own usernames and as many accounts as you’d like, so it’s easy to remain relatively anonymous. And unlike Twitter, it’s very easy to browse communities (AKA subreddits), which are subsections of the site dedicated to a particular topic. Similar to the other platforms, Reddit allows users to upvote items they like (as well as downvote items they don’t), respond to what others have posted, and create their own posts. Also, I personally find the organization of Reddit much easier to navigate than some other social media sites. I’m old school, and Reddit is visually similar to a cross between an original online Bulletin Board System (BBS) and an email inbox. Users view a list of posts from other users. The view can be filtered by popularity (“Hot”), chronology (“New”), and highest-rated (“Top,” which includes filters for “Past Hour,” “Past 24 Hours,” “Past Week,” “Past Month,” “Past Year,” and “Of All Time”), as well as a few other options. Within each post is a thread of comments and reactions. It’s quite easy to find information, and it’s very simple to visually parse at a glance. 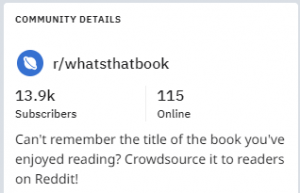 There are over a million communities on Reddit, with more being added every day. Each community focuses on a certain topic or theme. Some are serious (“WorldNews,” “MentalHealth,” “Education”). Some are not (“Jokes,” “Funny,” “SpaceCats”). If you want to know about a topic, or want to share what you know, there’s probably a community out there waiting for you. They’re super-easy to search for. Just go to reddit.com and type the topic you’re interested in into the search bar at the top of the page. 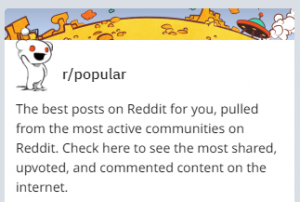 Reddit will show you communities and individual posts that are related to your search. Then you can click to view. It’s that simple! Another handy Reddit feature: You don’t have to create an account to browse or search the site. If you do sign up for a free account, you will gain the ability to interact with the site. This adds the ability to create new posts within communities, reply to other users, create your own communities, upvote or downvote content, subscribe to (create a list of) your favorite communities, etc. Choose a unique username and create a password, and prove you’re not a robot. Click the “Sign Up” button. That’s it! At this point, users can start to customize their account by subscribing to communities, which basically means choosing the topics you are interested in seeing when you come to Reddit. Speaking of communities, let’s take a quick tour of some of the educator-friendly highlights, shall we? One of my favorite elements of the Books community is the weekly book recommendation thread. 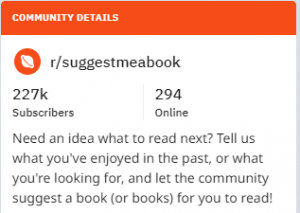 Users seek suggestions for titles they might like, and other users provide suggestions based on the details provided in the initial request. This is one of the big reasons I wanted to be a librarian in the first place — helping people find great books! To my mind, this is what social media technology should be about: being social by helping others. In addition to the book suggestions, the discussions found in the Books community are engaging and lively. 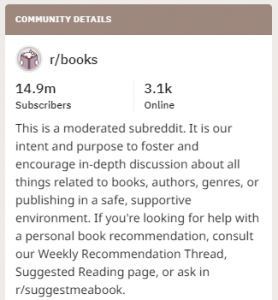 Users can take part in the monthly book club, weekly discussion threads, and tons of interesting posts about books and reading. I’m also partial to the “Suggest Me A Book” community, as mentioned in the Books community details (despite their problematic grammar). It’s a great place for librarians looking to expand the collection in a particular area. I’ve gotten great suggestions from this community that enhance the offerings available in the school library for a particular theme. A few that supported my teachers and my students: unreliable narrators, sci-fi from female authors, and fiction about mental health issues in teens. It’s also great for educators looking for ideas for particular types of books that might work with a particular lesson. I’ve used ideas from this community as suggestions for addition to curricular materials lists, as well as for reader’s advisory ideas to help students with thematic independent reading requirements. This is a chance to play Sherlock Holmes, or put some of those thousands of hours of reading to use helping others. This community is very straight-forward. Users post the details of a book whose title they can’t remember, and community members try to help them identify the book. A few years ago, I was thinking about books I’d read in my pre-teen years, and there was a book whose cover was photo-perfect in my mind, except for the title. I could remember a few general plot points, but I was unable to track the book down anywhere with the limited information I had. On a whim, I posted a description of the cover and the scanty story info I could recall to this community. Within a few hours, someone had responded with the title and author. It was like magic! I was able to track down a copy of the book and relive a wonderful childhood moment by reading a mediocre sci-fi paperback, and it was outstanding! Now, I swing by a few times a week and offer suggestions myself. I have to admit, I find it a bit humbling how infrequently I’m able to provide a useful suggestion. But I’m also amazed at how many people are helped out in finding that book they will never forget, even if they can’t quite remember it. Don’t let the title fool you! 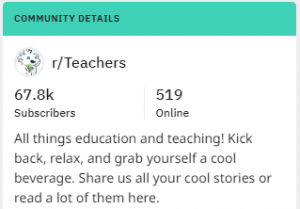 If you’re in education, this is a community for you. It’s all about the things that make being educators so great! I’ve been a classroom teacher for 20 years, and I really enjoy visiting the Teachers community. Sometimes I find great ideas I can bring back to my classes. Sometimes I laugh along with the stories that people outside the profession wouldn’t believe are real. If I’m looking for ideas or assistance, the users at Teachers are usually more than happy to offer tons of advice and ideas. This is a community in the truest sense of the word. Teacher-librarians will find inspiration and entertainment here. And it’s a great way to expand your professional learning network beyond the walls of your school! This one sits a little more squarely in the Knowledge Quest readers’ wheelhouse. While many of the posts here are from librarians, there are also news posts, questions from patrons, and tons of useful ideas and pieces of advice from all over. I find myself visiting Libraries to check out what other folks are thinking about and doing. 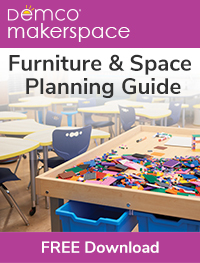 While not exclusively focused on school libraries, there are still some great pieces of information and inspiration that can be found here. Like the Teachers community, the Libraries community is a great way to expand your professional learning network quickly, easily, and for free. What’s not to love about that? OK, confession time: This is an “aspirational” suggestion, because right now, this community is dead. 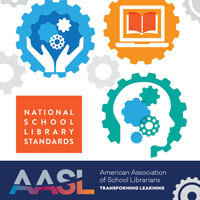 A few months back, I took part in a SLMS-school online class discussion about maintaining strong connections with SLMS classmates and colleagues. I was going to build my own site where people could have conversations and seek out advice, when it occurred to me that Reddit is already designed for that. 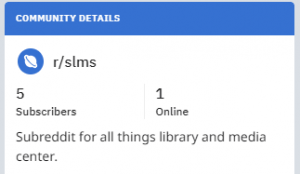 So I went to Reddit, thinking would start an SLMS community. I was pleasantly surprised to find it already existed! That is, until I saw that it had 5 subscribers. Of the four posts currently on the community, three of them are mine. But I’m hoping this will become a thriving destination where school library media specialists share their particular insights and issues. Feel free to come by and add your thoughts! You never know what you’re going to come across here. One of the things I love about Popular is that it gives me an overview of all sorts of interesting “stuff” that I would otherwise never see within my collection of news sources and search bubbles. Sometimes, Popular gives me ideas I can take back to my students, my classroom, or my library. Other times, it’s just really interesting. And more often than not, when a friend or family member shares something interesting they found online, I’ll find myself saying, “Oh, yeah; I saw that the other day on Reddit.” And who doesn’t love being ahead of the curve? This isn’t a community, but rather an event. AMA stands for “Ask Me Anything.” Many communities host AMAs, where an expert or celebrity will have a live question-and-answer period with users. AMAs have been done by billionaire Bill Gates, scientist Neil deGrasse Tyson, then-President Barack Obama, astronaut Chris Hadfield, entertainer Snoop Dogg, musician Madonna, and many more amazing celebrities and experts. Even when AMAs do not feature household names as their guests, they can be incredibly fascinating. The Books community often has AMAs featuring authors and publishers. These can offer some very interesting insights into the world of books and writing. Although I just said AMAs are not a community, I Am A… is a community where people with firsthand knowledge, expertise, and/or experience offer all sorts of insights into all sorts of topics through a series of AMAs. This could be a great resource for finding firsthand information, or for tracking down lesser-known sources of information. The above Reddit communities barely scratch the surface of the great resources available within the world of Reddit. The News (reddit.com/r/news/) and WorldNews (reddit.com/r/worldnews/) communities provide links to the latest stories from a wealth of sources, most very reliable, from all over. Communities like LGBT (reddit.com/r/lgbt/) and Bullying (reddit.com/r/bullying/) offer information, insight, and resources that could be useful for particular populations or inclusion projects. I have pulled some very interesting class writing ideas from Writing Prompts (reddit.com/r/writingprompts). And while working on writing up this post, I pointed a fellow librarian to Tip of my Tongue (reddit.com/r/tipofmytongue) for help finding a partially remembered song from a twenty-year-old movie after other avenues of research had been exhausted. 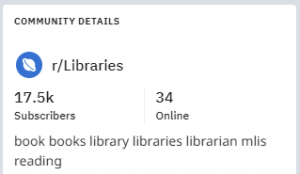 Reddit offers librarians a great research resource, as it harnesses the power of crowd-sourcing. So even if none of the above is quite what you’re looking for, don’t let that prevent you from checking out Reddit. According to redditmetrics.com, as of January 10, 2018, there were 1,209,738 subreddits, or communities. And if you can’t find what you’re looking for within that vast collection, you can create your own community! You can’t lose! While there are some AMAZING resources available via Reddit, remember that no technology is perfect. Reddit is an open forum for anyone on the Internet. That means there’s all sorts of stuff to be found. Most of the questionable stuff is marked as inappropriate for the workplace, and a lot of the non-family-friendly stuff is pretty easy to pick out based on community names. So while Reddit can be a great tool for adults, I would be hesitant to bring students to Reddit, as there’s plenty of NSFW content that is extremely easy to access. And, like any technology, Reddit can be misused. It is not without it’s scandals, particularly regarding the “alt-right movement.” However, the uses a tool is put to come from the user, not the tool. And Reddit is a valuable tool to have in a librarian’s toolbox! Steve has been teaching middle school English for 20 years, has several degrees in education, and recently finished his last semester as a school library media specialist student. He certified as a teacher, school library media specialist, supervisor, and administrator. He is an old dog constantly learning new tricks! ‹ Summertime – Relaxation, Renewal, and Advocacy! Kate – Well, I did say Reddit hadn’t been involved in a data scandal “yet” – I guess I can remove that modifier! Great article! Found a couple of new subreddits to follow! :) I have become obsessed with Reddit due to the variety of information available. I firmly believe that the positives significantly outweigh the negatives as far as the NSFW groups. I hope your SLMS page gets active (I’ve been in public libraries my whole career so won’t be much help) and good luck with your masters! Congrats on your published blog post, Steve! I have never used Reddit before, but I am going to check it out now! Trista – Thanks for the feedback, and I hope you enjoy those new subreddits! I agree; Reddit offers such a range of topics and information, it seems like a pretty useful tool for librarians. Be sure to share the wealth with all your library friends! Beth – Thank you! I was pretty excited to get a post published. I hope you find Reddit to be helpful, or at least fun!